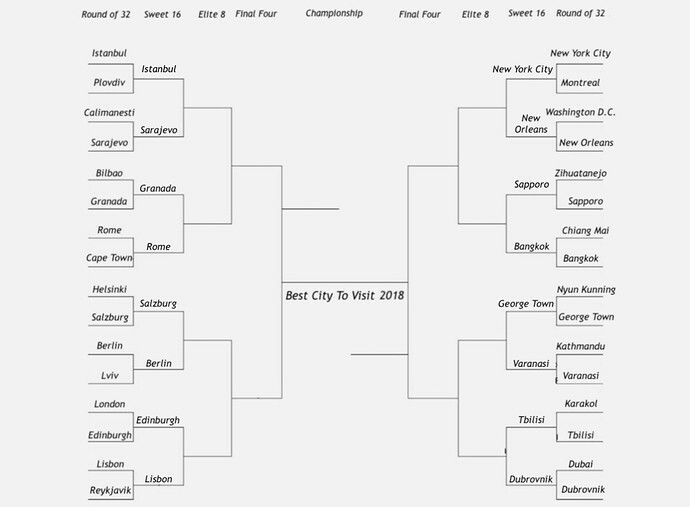 The Best City To Visit Travel Tournament is consistently unpredictable. Romania, typically one of the strongest countries in the contest, was edged by former champion Sarajevo. Last year’s winner Granada, had the most total votes in round of 32 last week, making the left side of the brackets very competitive. Quietly though on the right are some interesting challengers. Readers, it’s time to vote! Click your favorite cities before this Sunday, March 18th, 6pm US EST. Remember, the next round of Elite 8, begins next Tuesday, March 20th, 2018. Currently leading: Dubrovnik, Istanbul, Granada, Salzburg (very close), Lisbon, New York City, Bangkok, George Town (very close). Granada is te best !!! Es las más bonita sin duda!! Granada es la mas bonita del mundo.